recognizing "China's Unsung Heroes of Christ." The gilded icons and jewel-like stained-glass windows depict saints, inspirational art familiar to worshippers at Saints Constantine & Helen Greek Orthodox Church. But it was a small bright-colored print that she found in the gift shop of the Punchbowl church that "absolutely thrilled" Alice Malick. 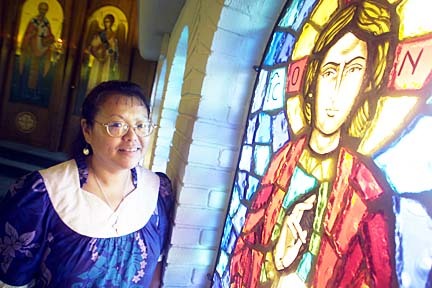 Like hers, the faces of the grouped saints are Chinese. 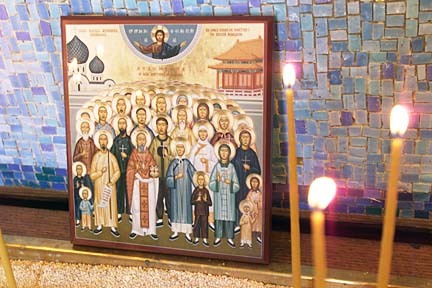 The icon memorializes Chinese Christians who were slain in June 1900 in Beijing during the Boxer Rebellion. In all, 222 men, women and children are recognized as martyrs, killed because of their faith, in a Chinese political movement that aimed to drive Westerners and Western influence from the country. "I felt a spiritual connection with the Chinese martyrs," said Malick, a convert to Orthodox Christianity four years ago. "It was like finding a pearl buried in sand." Excited by the surprise discovery of a spiritual heritage, Malick energized her pastor, the Rev. Dean Kouldukis, and congregation members into a plan for a special celebration that will recognize "China's Unsung Heroes of Christ" Sept. 7. They are inviting the public to the 6 p.m. historical presentation and vespers service in the church at 930 Lunalilo St.
"We've wanted to raise the profile of Orthodoxy in the islands," said Kouldukis, whose congregation's only public exposure comes when they sponsor the Greek Festival, under way from noon to 9 p.m. today and tomorrow at Ala Moana Park McCoy Pavilion. The membership reflects countries in which the ancient branch of Christianity is established. There are also people of Chinese, Japanese, Korean and Filipino ancestry, most of whom are converts to the "Christianity of the East." "Alice came to me and said, 'I've got this idea.' She was so enthusiastic, how can I say no?" the priest recalled. And conscious that it's already one year past the centennial of their ultimate testimony of faith, she wasn't interested in waiting until the feast day of the Chinese martyrs comes up again on the liturgical calendar next June 11. Boxer Rebellion of 1900 in Beijing. The child of Chinese immigrants, Alice Mui Malick grew up in Chicago. She remembers her Buddhist parents being upset and angry when, as a child, she was interested in the overtures of a Christian missionary. "Some missionaries are misguided; they saw us as heathens, souls to save." Perhaps that's why she takes such delight in research in which she discovered that the Orthodox faith was brought to China in 1685 by Russian captives. The Chinese government recognized it as a religious entity in 1864. "I am thrilled to know that Chinese Christians lived in China hundreds of years before Western missionaries arrived. It makes me feel that Christianity is truly universal." Persecuted 100 years ago and suppressed by the communist regime for the past half-century, the church has almost vanished in China. There is only one known functioning parish, Malick said. Although the members of the Church of the Protection of the Theotokos in Harbin number about 18, more than 400 people returned to the church for Easter, according to an Orthodox publication. Some 190 of the 222 martyrs are known by name, which makes the connection more real, she said. The Chinese martyrs were memorialized in a series of hymns composed in the church's monastic tradition, which will be sung by the choir at the special vespers service. Malick's husband, Gregory, will be the chanter. Kouldukis said the lives of saints and martyrs, and the hymns about them, are important "as a way to teach us, so that we can emulate their faith and courage." Malick began seeking answers and a belief system after her mother's death 15 years ago, she said. She sampled everything from Zen meditation to various Christian sects to New Age movements. When she finally attended the Orthodox church, in which her husband had been raised, she found "my soul was being fed and my spirit was lifted up slowly." Although few are called to martyrdom these days, Eastern Orthodox Christians follow a rigorous path even in these indulgent times. Twice each week, Wednesdays and Fridays, Malick joins other believers in abstaining from meat, fish, dairy products, oil and wine. The practice, which dates back to the fourth century, is their way of remembering how Jesus Christ died and affirming their commitment to his teaching. Four times during the year, the fasting is extended for prolonged periods. Recently, in preparation for a special holy day Aug. 15 dedicated to Christ's mother, the Orthodox believers fasted for 15 days.